Meghan Yarnall of Chester County poses with her daughter, Gwendolyn, who has a rare gene mutation. 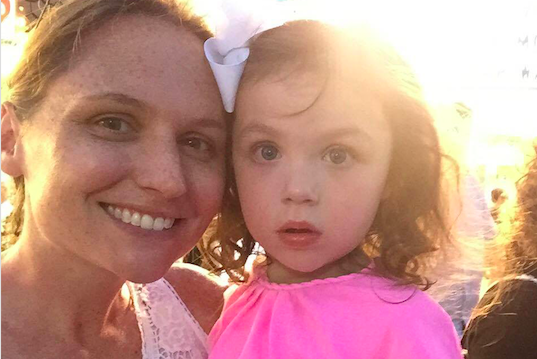 A Chester County woman has taken to Facebook in hopes of connecting with a family whose grown child has the same rare gene mutation as her own young daughter. Within 24 hours of posting a video on the social media platform, a connection appears likely. Meghan Yarnall, of West Goshen, says she communicates with several families who also have children diagnosed with an SOX5 gene mutation, which results in intellectual speech and visual impairments. Yarnell's three-year-old daughter, Gwendolyn, was diagnosed in October with an SOX5 gene mutation in her 12th chromosome. Given the rarity of the mutation – about 20 children worldwide have been diagnosed – Yarnall says she finds comfort talking to parents facing the same challenges. But each of their children is relatively young. "We all have these challenges," Yarnall said Friday afternoon. "To meet someone who has gone through the whole childhood and adolescent phase, it would be life-changing." Yarnall says staffers at Children's Hospital of Philadelphia had been trying to connect her to the family of an 18-year-old with an SOX5 gene mutation, but due to HIPAA regulations the hospital could not provide her with any information about the family. So, Yarnall also decided to make an impassioned plea on Facebook. She posted the video Thursday evening, encouraging anyone who knows the family to have them reach out to her. As of Friday afternoon, the video had been viewed more than 108,000 times and shared more than 2,500 times. And by late Friday afternoon, Yarnall says the family had reached out to CHOP. "They would be able to help us so much," Yarnall said. "Nobody knows how to help our kids. ... We all have so many questions about the proper placement for them in schools, how to navigate the school system. When you have a diagnosis this rare, schools don't know what to do with it." It was not immediately clear whether the family had seen Yarnall's Facebook post or responded to an inquiry made by CHOP. A hospital spokesman said he was unable to comment, citing patient privacy laws. Yarnall was ecstatic. She again took to Facebook to thank everyone who shared her video. "I have to first thank Children's Hospital of Philadelphia for their amazing efforts and hard work to connect us!" Yarnall wrote shortly before 5 p.m. "But I HAVE to thank the THOUSANDS of you (so crazy!) who have shared my video because without you, this would not have been possible!" The SOX5 gene mutation has both impaired Gwendolyn's vision and affected her ability to speak, Yarnall says. Though Gwendolyn is 3 years and 6 months old, Yarnall says her intellectual development is closer to 12 to 18 months. At about nine months, Yarnall says she noticed Gwendolyn was exhibiting signs of delay. She only began saying a few words several months ago. And though her eyes are fine, Yarnall says her brain doesn't properly process what they are seeing, a condition known as cortical visual impairment. "They can't navigate their environment that well," Yarnall said of children with the mutation. "They fall a lot. My daughter has had concussions, she's had stitches. Playgrounds are our worst enemy." Though Gwendolyn cannot talk, Yarnall says her family has learned to respond to her needs by understanding her schedule. If Gwendolyn becomes upset at 5 p.m., Yarnell says she's likely hungry. If she cries several hours later, she's probably tired and needs to get to bed. "She doesn't have any way of telling us," Yarnall said. "She loves water, anything with water — ocean, pools, baths. She'll never be able to tell us that she wants to take a bath to play in the water." Very little research has been conducted on SOX5 gene mutations, Yarnall says. One family, whose daughter Harper has the same mutation, has started an online fundraiser through the Cleveland Clinic Lerner Research Institute to raise money for research. But to better understand what to expect for Gwendolyn's immediate future, Yarnall took to Facebook. And she connected.